During the septoplasty operation, curved cartilaginous areas of the nasal septum are cut and the nasal septum is made flat by removing or rectifying the curved cartilage.That is, surgical treatment is applied to the septum cartilages in the nose. This surgery is the most appropriate application to be done after nose development is complete. In some areas of the nasal septum are areas responsible for nasal growth or nasal growth points. Nose growth, usually in girls 18 years old men continue to 20 years. In the case of a serious nasal obstruction, nose surgery can be performed from the age of 17. Ideally, waiting for completion of the nose development is the most appropriate application. These age limits are generally used for nasal surgeries, except roughly turbinate radiofrequency operations. In children with advanced nasal septum deviations causing nasal obstruction, "pediatric septoplasty operation" of limited cartilage resection is rarely performed. 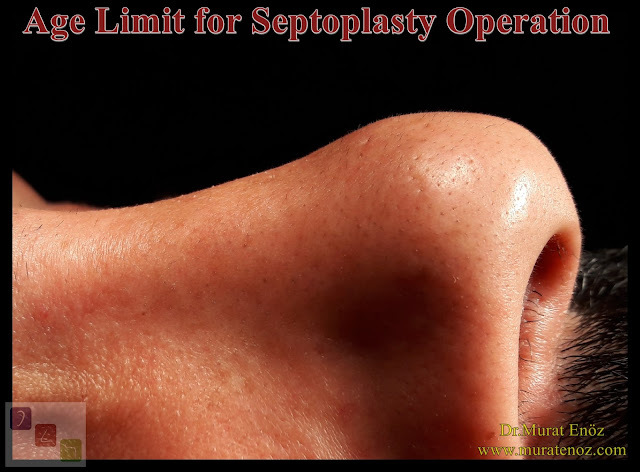 Age limit for septoplasty operation Age of septoplasty operation in children How early is the septoplasty operation performed?